Why Preschool Suspensions Still Happen (And How To Stop Them) : NPR Ed Thousands of children in public pre-K, especially black preschoolers, are suspended each year. The problems are clear. So are some fixes. In all, 6,743 children who were enrolled in public pre-K received one or more out-of-school suspensions in the 2013-14 school year. Glass half-full: That number's down slightly and relatively small considering the 1.4 million kids who, according to the Education Department, attended public pre-K that year. Glass half-empty: That's 6,743 kids too many, say several top child development experts. "To be clear, preschool suspension just shouldn't be a thing for any kid," says Maryam Adamu, who until recently studied early childhood policy at the Center For American Progress. To stop preschool suspensions, Adamu argues, it's important to understand why they happen. One reason: money. "You get what you pay for. When we're underfunding programs, we're sort of setting ourselves up to fail." Training and pay for preschool teachers are often abysmal. In several states, including Ohio, Tennessee and Wisconsin, the average pre-K teacher earned below the 2015 federal poverty line for a family of four. 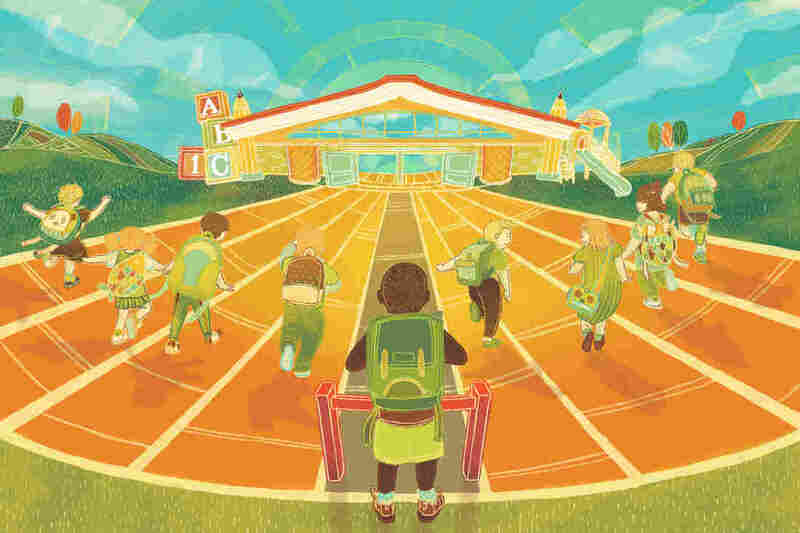 "Pay in many cases is far less than you can get for even watching cars in a parking lot," says Yale University's Walter Gilliam, who has spent more than a decade studying preschool suspensions. What's more, he argues, it's not just about teachers earning a poverty wage. It's also about kids living in poverty and the effect that can have on their behavior. "Children who live in highly stressful conditions or children who are exposed to lots of trauma — these children are going to be far more likely to be exhibiting behaviors that the teacher may not fully understand," Gilliam says. According to the U.S. Census Bureau, roughly 10 percent of white children lived in poverty in 2013. For black children, that number was nearly 40 percent. Finally, the challenge that is perhaps the hardest to quantify: the implicit bias of teachers. Gilliam says most adults tend to see disruptive behaviors differently, depending on the race of the child. "And we tend to hold African-American children as more culpable. And we think they're older than they are." What can be done about all of this? Two things, says Gilliam. First, don't make suspension an option. Ban it in preschool. And second: Give teachers extra training and support. At Van Ness Elementary in Washington, D.C., they've done both. Right now, Van Ness serves only the youngest students: 3- and 4-year-old preschoolers and kids in kindergarten. That's it. D.C. has largely banned pre-K suspensions. Instead, teachers at Van Ness, led by their head of school, Cynthia Robinson-Rivers, work hard to hold onto — and help — their most disruptive kids. "For example, if a child is on the rug and hits the child beside them — you wouldn't say, 'Stop hitting,' " says Robinson-Rivers, because calling out bad behavior reinforces it. "We would say something like, 'We keep safe hands. This is what safe hands looks like.' And you would model having your hands in your lap." Also, every pre-K classroom at Van Ness has what Robinson-Rivers calls a safe space, where disruptive kids can go to calm down. "In some classes it's a little tent, so kids can go in and have a private area. It's cozy and cuddly in there." Preschoolers are also taught calming techniques — like breathing slowly into a pinwheel to make it spin. As for Van Ness teachers, they're trained in what's called Conscious Discipline and they have a strong network of supporters to help them understand and address challenging behaviors. That network includes a staff social worker, a psychologist and weekly visits from a clinical psychologist. As for the role of implicit bias, Robinson-Rivers and her teachers talk openly and honestly when students are flagged for behavior. "And if, after a few weeks, we look at our [behavior] list," Robinson-Rivers says, "and it's all black boys, we have a conversation right there — to make sure we're not seeing behaviors differently based on the gender and the race of the child." Next year, the school plans to take its behavior approach to the next level: helping parents do at home what teachers are doing in the classroom.